In with the New…but Keep Much of the Old | Trex Commercial Products, Inc. 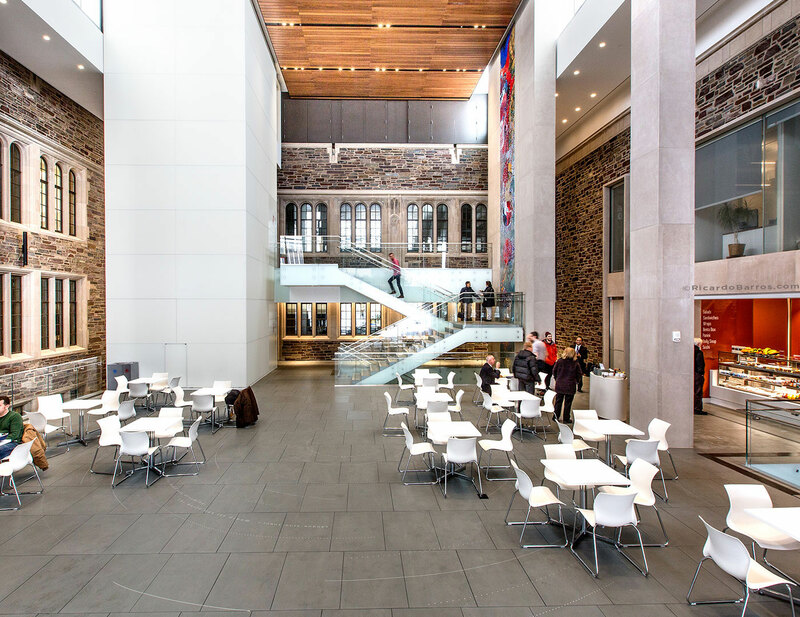 When renovating a historic structure at the center of one of the world’s most prestigious university campuses, one must make every effort to ensure the traditional, Ivy-league feel remains intact, even while adding modern elements of architecture and design. This was the challenge presented by Princeton University’s 20 Washington Road renovation. Built in 1929 as the Frick Chemistry Laboratory, the Collegiate Gothic structure had been vacant since the department relocated in 2010. The new facility will house the university’s economics and international studies programs, centralizing those two academies that were previously scattered in multiple buildings across campus. The challenge was to add a modern look and feel (both interior and exterior) to one of the most prominent campus buildings clad in the same argylite stone, limestone-framed windows and vaulted ceilings as the majority of the heritage campus buildings for which this and many other Ivy League schools are known. According to KPMB, the architect selected to lead the renovation, the design concept focused on “an extensive transformation of the interior into a light-filled, accessible learning environment with a coherent system of corridors and public spaces while preserving the historic character of the exterior and key primary interior spaces, particularly the entry and the second floor library.” The facility also called for the creation of additional entrances to help bring the community together, hence the renovation of the existing atrium at the Washington Road entrance and a second atrium adjacent to Scudder Plaza, a focal point and causeway for the university campus. Trex Commercial Products was selected to provide over 3,300 feet of ornamental railing for the project and assisted with the task of achieving a modern, vibrant feel while allowing the character of the building to shine through. 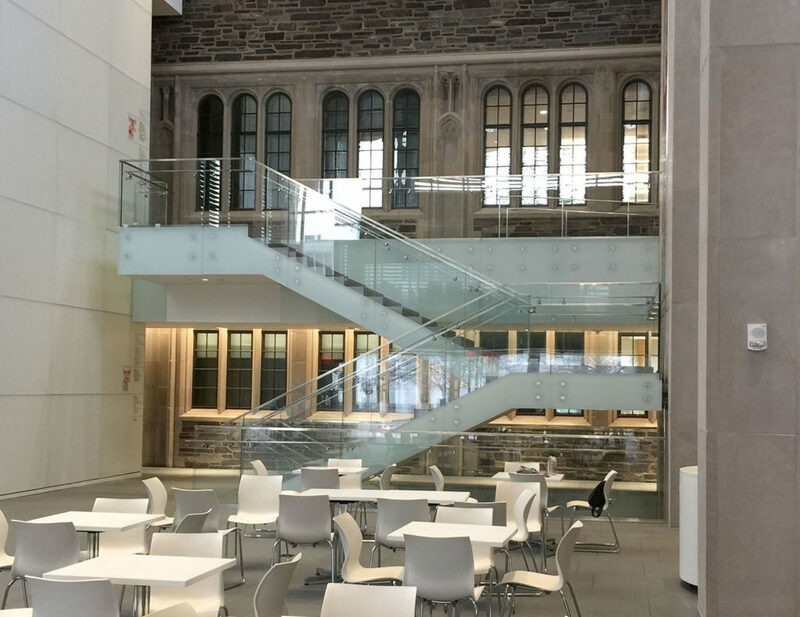 Trex Commercial Products was selected to provide over 3,300 feet of ornamental railing for this Princeton University project. 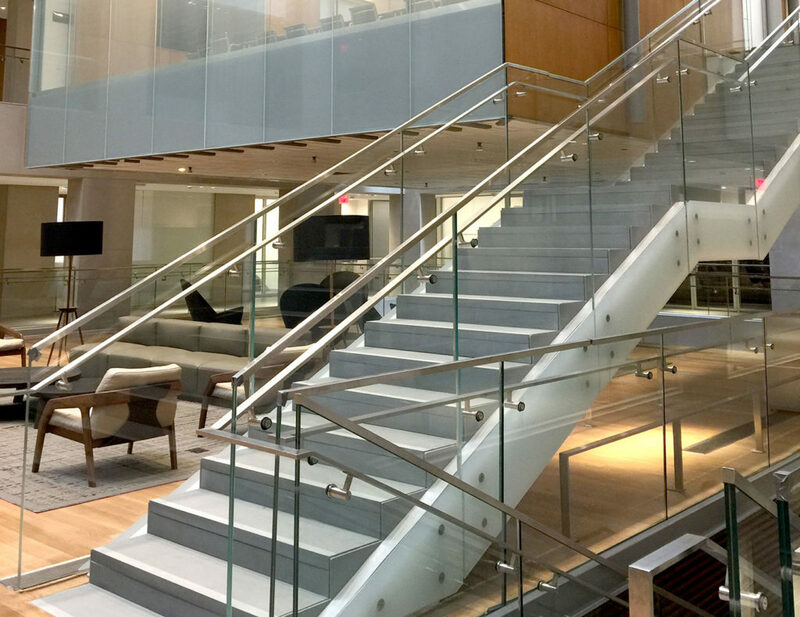 Trex Commercial Products provided a variety of glass-paneled ornamental railings both inside and outside the facility offering unobstructed views of both the original architecture, and modern additions. This not only allowed natural light into the complex, but also complimented the building’s new character. On the exterior, a newly created bridge is framed by Trex Commercial Products’ proprietary Point-series glass railing with 1-inch laminated tempered low-iron glass that affords a clear view of the structure’s original external masonry. 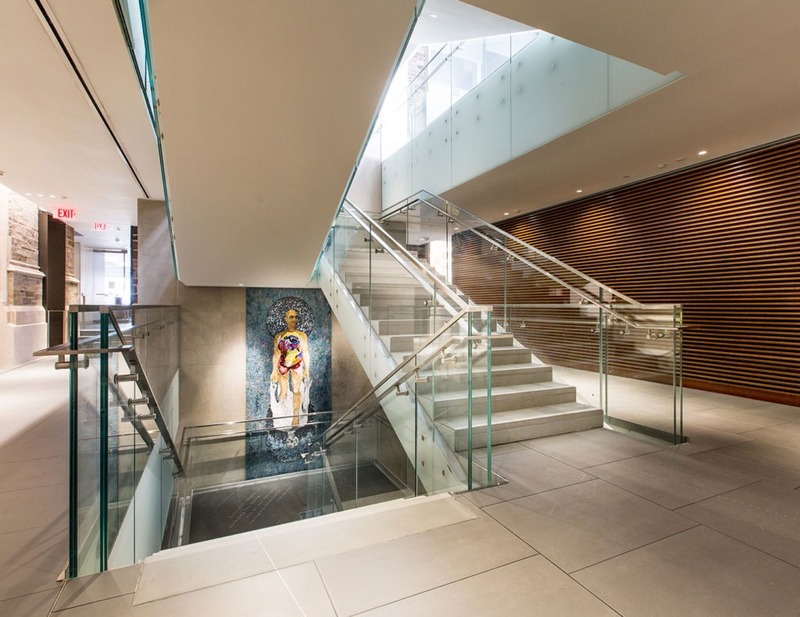 The building’s three-story main atrium features suspended, glass-walled meeting rooms and multi-level stairs and balcony overlooks encompassing more than 950 feet of Point-series glass railing that adds a minimalistic look to the space. The railings’ custom fascia-mounted stainless steel nodes are countersunk into the glass, and attached via stud-weld to a steel stringer. An 18-gauge stainless steel top cap tops off the 1-inch thick low-iron glass with PVB interlayer creates a one-of-a-kind look throughout the facility. The same glass railing system can also be found on exterior balconies overlooking campus on the west side of the structure. More than 1,200 feet of Trex Commercial Products’ proprietary Track Rail system was utilized throughout the facility, including multi-level stairs, balcony overlooks and fire shutter barriers. For this system, the aluminum shoe profile is mounted on a steel angle that is welded to the side of the stair stringer. To provide a consistent look and feel throughout the interior, the 1-inch tempered laminated glass with stainless steel top cap that was used in the Point-supported system was also used within the Track Rail system. A custom grey gasket finishes off the top of the Base Shoe system after the glass has been set to achieve the desired look. Another unifying element to the system is the custom stainless steel 5/8-inch by 2-inch flat bar handrail fabricated with stainless steel standoffs utilizing #4 finish, and NOMMA #1 that was used on all welds throughout the building’s stairs and overlooks. This same custom-designed handrail carries over to the custom post-supported railing on multiple facility ramps utilizing the flat bar and posts and a 4-inch wide, 3/8-inch thick continuous stainless steel base that was epoxy anchored into the structure. Glass infill is brought down to be flush with soffit. Facility features over 2,400 ft. of custom stainless steel flat bar handrail – 825 ft. of that is wall mounted. 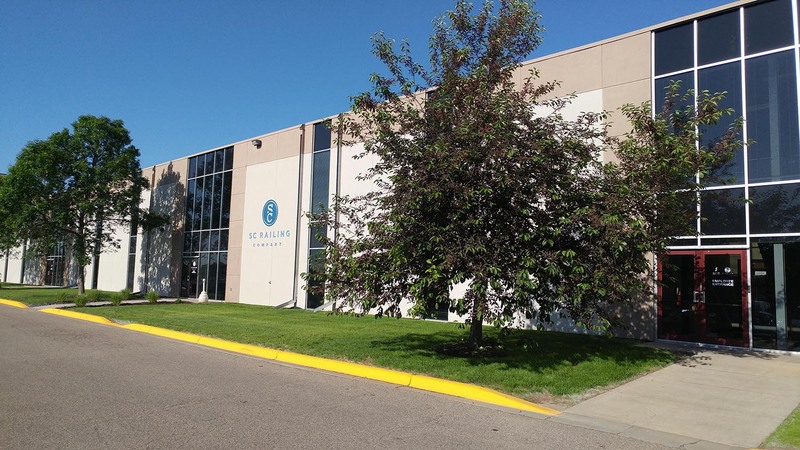 By using glass and unobtrusive mounting structures, Trex Commercial Products was able to achieve the desired result, providing a contemporary look while preserving the building’s heritage components. Additionally, Trex Commercial Products was able to open a window to the future by using recyclable materials throughout, contributing to the university’s desire of achieving LEED gold status for the project. 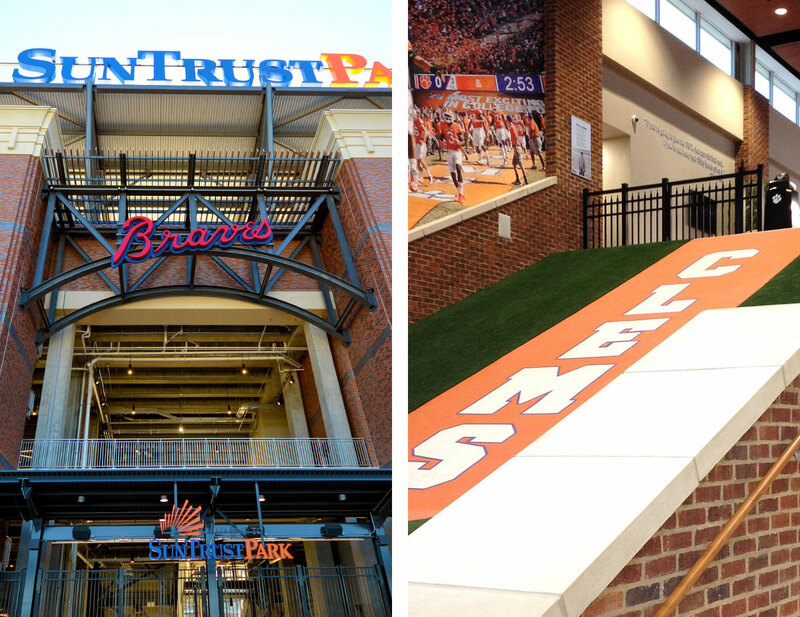 Trex Commercial Products was honored to work with KPMB Architects, Barr & Barr and Clear View Architectural Metal & Glass contributing our Point Series, Track Rail and custom railing solutions to this historic renovation. Click Here for additional project Photos!